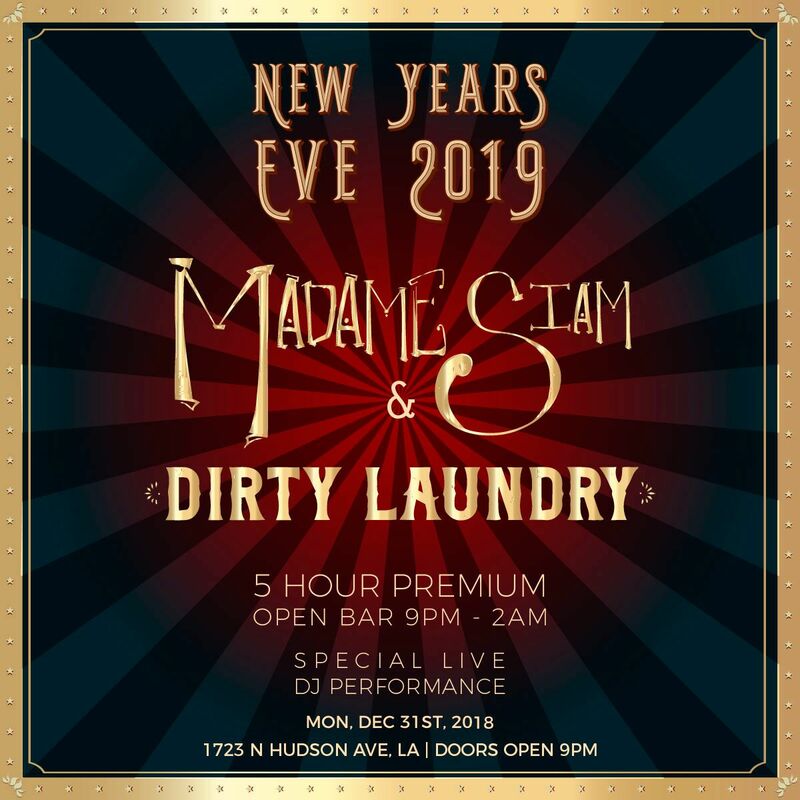 Madame Siam’s and Dirty Laundry provide this year’s can’t-miss New Year’s Eve party, featuring premium amenities and LA’s favorite party people. Eastern-inspired aesthetics meet the prohibition-era underground at these haunts, which will come alive this NYE with the sounds of premier DJ talent. Get ready, LA – this party will pulsate across Hollywood. These two major entertainment complexes are destined to deliver an unbeatable New Year’s party, featuring a five-hour premium open bar. Exceptional live DJ talent ignites the dance floor with the sounds of Top 40, hip hop, and house music mashups. You won’t miss a second of the countdown to midnight with the live countdown, polished off with a complimentary champagne toast. Looking to make your night even more deluxe? Choose a VIP package, offering perks like table service, bottle service, and more. A geisha getaway, Madame Siam’s combines Eastern aesthetics with the allure of underground nightclubs. Charming accents like emerald-colored wallpaper, Oriental rugs, and bird cages liven up this exotic space. The adjoining Dirty Laundry provides rich prohibition aesthetics, featuring poured concrete and vintage accents like antique lamps and portraits of Hollywood stars. Seductive and inviting, both Madame Siam’s and Dirty Laundry are sure to excite this NYE. With the best amenities on offer – and two venues revered by LA’s movers and shakers – this is your ticket to a night than shines brighter than the Hollywood stars.